周水茂, 李联军, 贾西帅, 杨燕, 徐明星, 陈芳. 输入性恶性疟原虫Pfcrt和pfmdr1基因突变关联性分析[J]. 中国媒介生物学及控制杂志, 2018, 29(3): 242-245. ZHOU Shui-mao, LI Lian-jun, JIA Xi-shuai, YANG Yan, XU Ming-xing, CHEN Fang. 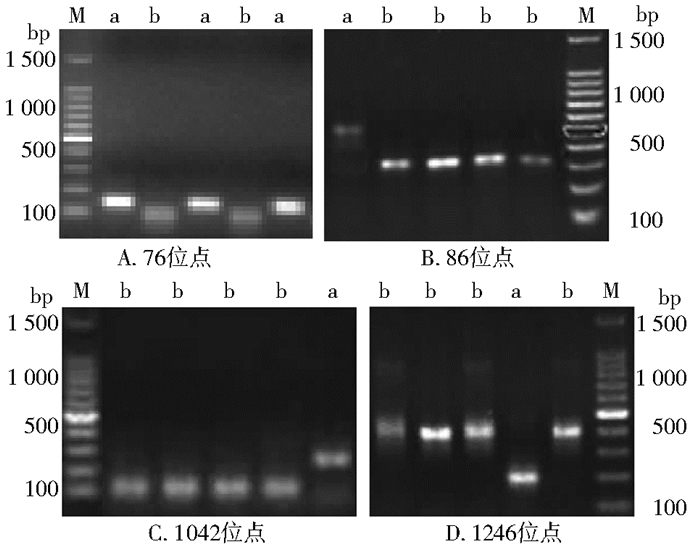 Correlation analysis on mutations of chloroquine resistant transporter and multi-drug resistance 1 gene in Plasmodium falciparum imported to Wuhan, China[J]. Chin J Vector Biol & Control, 2018, 29(3): 242-245. Corresponding author: LI Lian-jun, Email: 2258824595@qq.com. Abstract: Objective To identify Plasmodium falciparum chloroquine resistant transporter (Pfcrt)point mutations and P. falciparum multidrug resistance 1 (pfmdr1)and their correlation in imported P. falciparum. Methods Blood samples were collected from returnees infected with P. falciparum in endemic areas of Africa and Southeast Asia during 2009-2016 in Wuhan city. 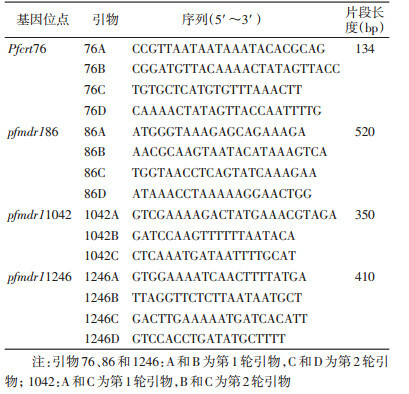 The Pfcrt76 gene and pfmdr1 gene were amplified by nested PCR, and the products were digested by restriction endonuclease ApoⅠ, AseⅠ and EcoRv. The mutation rate was analyzed. Results A total of 232 patients with falciparum malaria were involved in the study. The mutation rates for Pfcrt76, pfmdr1 loci 86, 1042, and 1246 were 55.2%, 17.2%, 5.2%, and 8.6% respectively, the total mutation rate for pfmdr1 was 26.3%. The mutation rates for pfmdr1 loci 86, 1042, 1246 and pfmdr1 were 28.6%, 3.8%, 12.4%, and 36.2%, respectively in the samples with mutation in Pfcrt76, but 10.4%, 2.1%, 7.3%, and 17.7%, respectively in the samples without mutation in Pfcrt76 from Africa. The linkage disequilibrium analysis between symptoms and the mutations of Pfcrt76, pfmdr186, 1042, and 1246 were conducted, and the value of D'and r2 were 0.230 and 0.018, 0.290 and 0.004, 0.996 and 0.012, 0.150 and 0.035, respectively, for each mutation. Conclusion The pfmdr1 mutation sites between Africa and Southeast Asia have statistically significant differences. Pfcrt76 was positively correlated with pfmdr1 mutation and pfmdr186 point mutation. World Health Organization. World malaria report 2015[R]. Geneva: WHO, 2015. 汤林华. 输入性疟疾的诊治与管理[M]. 上海: 上海科学技术出版社, 2010: 30-45. 周水茂, 杨燕, 吴凯, 等. 非洲输入性恶性疟病例裂殖子表面蛋白1等位基因型检测[J]. 中国寄生虫学与寄生虫病杂志, 2015, 33(4): 247-250. 周水茂, 杨燕, 陈智, 等. 输入性恶性疟原虫Pfcrt基因76位点多态性分析[J]. 中国血吸虫病防治杂志, 2013, 25(4): 402-404. 张丽, 丰俊, 张少森, 等. 2015年全国疟疾疫情分析[J]. 中国寄生虫学与寄生虫病杂志, 2016, 34(6): 477-481. 郭传坤, 黎军, 林康明, 等. 广西2010-2012年输入性疟疾流行病学分析[J]. 中国媒介生物学及控制杂志, 2014, 25(4): 333-336. 王亚丽, 王煊, 张彦平. 2005-2013年全国本地感染与境外输入疟疾流行病学特征分析[J]. 中国媒介生物学及控制杂志, 2015, 26(2): 120-126. 官亚宜, 汤林华. 恶性疟原虫药物抗性相关的分子标记及其在药物抗性监测中的应用[J]. 中国寄生虫学与寄生虫病杂志, 2005, 23(2): 117-120. 张逸龙, 潘卫庆. 恶性疟原虫对青蒿素产生抗性的研究进展[J]. 中国寄生虫学与寄生虫病杂志, 2015, 33(6): 418-424. 王珊珊, 董莹, 邓艳, 等. 中缅边境恶性疟原虫pfmdr1基因多态性及pfmsp1等位基因分型研究[J]. 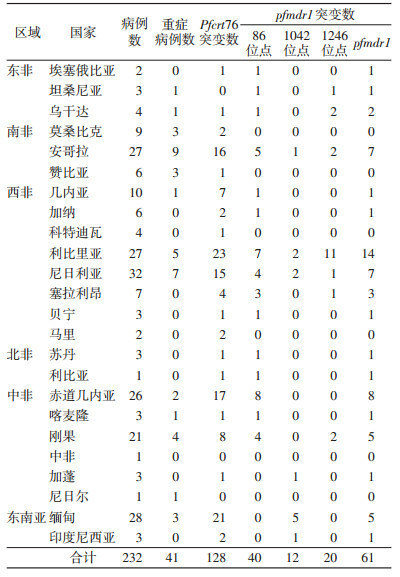 国际医学寄生虫病杂志, 2012, 39(2): 85-88. World Health Organization. Guidelines for the treatment of malaria[R]. Geneva: WHO, 2006. 徐超, 魏庆宽, 李瑾, 等. 输入性恶性疟原虫耐药相关基因Pfcrt和pfmdr1单倍型及突变分析[J]. 中国人兽共患病学报, 2016, 32(12): 1051-1057. 周瑞敏, 王轶南, 钱丹, 等. 2015年河南省输入性恶性疟原虫Pfcrt基因的多态性分析[J]. 中国寄生虫学与寄生虫病杂志, 2016, 34(5): 399-404. 邓艳, 王珊珊, 董莹, 等. 中缅边境恶性疟原虫Pfcrt基因76位点突变研究[J]. 中国人兽共患病学报, 2014, 30(11): 1137-1140.